Give us your tab titles and we’ll do the rest! Custom printed-to-order index tabs are manufactured to your specifications so you get exactly what you want – a professionally finished product delivered ready for use. 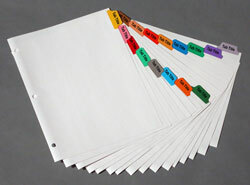 We offer a rainbow of lamination colors and a variety of paper stock and sizes. Tab lengths and printing styles can also be tailored to your informational requirements giving your presentations, catalogs or reports a more polished look that shows you mean business. To order just fill out a custom tab form and email it back to us along with your tab titles. We’ll quickly provide a print proof for your approval to insure that your tabs are printed correctly. NEED CUSTOM PRINTED-TO-ORDER TABS SUPER FAST? *Time starts after tab title art/proof is approved by customer. Art must be approved by 9:00 am CST by email or fax for that day to count as time used. If art is approved in time, the 2-Day or 3-Day Rush begins at that point. EXAMPLE: On a 2-Day Rush if art is approved by 9:00 am Monday we have until Wednesday pm to ship. Standard shipping method is UPS regular ground transit. Air shipment is available for an additional charge.